This expansion for the Spheres of Power-system clocks in at 27 pages, 1 page front cover, 1 page editorial, 1 page ToC, 1 page SRD, 1 page back cover, leaving us with 22 pages of content, so let’s take a look! This review was moved up in my reviewing queue at the request of my patreon supporters. After a brief piece of introductory prose, we begin with 9 new archetypes. Some of these do btw. come with Spheres of Might-synergy, but if you’re not using that gem of a book, you can still rejoice, as the section provides guidance to remove blended training/martial tradition. The first archetype, the chronomancer symbiat, gets both Time and Warp spheres at first level, or a bonus talent from the sphere if you already have it. This replaces mental powers. Instead of the usual psionics of the class, the chronomancer instead gets the means to teleport up to a light load as a move action, optionally as a swift action if the archetype has Quick Teleport. In the latter case, the chronomancer can only use this quicker teleport when teleporting themselves and up to medium load. While this does not require the expenditure of a standard action, it still consumes a round from the total array of psionic effects. Temporal feedback loop may affect a target within 60 ft. and lock a target on a failed Will-save in or make the target roll twice for most checks, taking the worse result. At 13th and 19th level, the chronomancer can maintain additional feedback loops at a given time, and round-expenditure is properly codified. Warp dodge allows the chronomancer to, as an immediate action add ½ class level (minimum 1) as an untyped bonus to a single saving throw of themselves or an ally within 60 ft.
As soon as 3rd level, the chronomancer can choose an ally within 60 ft, and use the chronomancer’s skill when making a skill check, aid another to assist as a free action and change the target. 10th level makes the ability affect all allies within 60 ft. At 6th level, we get warp edge, which doubles as a +2 circumstance bonus to atk, and a +4 untyped bonus to damage. 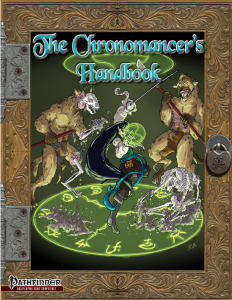 9th level and every 3 levels thereafter allow the chronomancer to affect an additional target. This one has a range of 60 ft. 7th level nets temporal accord, a mighty timestream that allows a group within 30 ft. to use the highest initiative roll, adding their own modifiers. Reflex saves may similarly be shared. (Minor complaint: Spell-reference not italicized.) This one is super-potent, and may warrant some scrutiny by GMs, particularly in groups that gravitate towards rocket-launcher-tag gameplay at higher levels or in mythic gameplay. 9th level nets Group Teleport and applies the action economy increases of the teleporting tricks to this. At 11th level, offers a defensive field within 30 ft. that nets a +4 insight bonus to AC and Reflex saves. 16th level nets Improved Haste, and when using haste, the chronomancer may expend two rounds of psionics to grant the target an extra move action, AoO and increase Improved Haste’s bonus, 19th level gets rid of the distance limitations of quite a few of the chronomancer’s options. Instead of 3rd level’s pushed movement, the chronomancer increases the maximum distance traveled via teleport (scales, fyi), and extends the duration of alter time effects. The second archetype would be the clockstopper gunslinger nets a martial tradition and blended training (Low-Caster, Wisdom as casting and practitioner ability modifier), replacing gunslinger’s dodge, gunslinger initiative, dead shot and lightning reload. The archetype gets class level + Wisdom modifier spell pool, and begins play with the Time sphere. Instead of pistol-whip, we have better reloading while under haste or alter time. Startling shot’s replaced with Leaping Shot Deed or another feat. Instead of slinger’s luck, 15th level nets the Second Chance talent, and the archetype may choose to double alter time’s effects on herself, and this doesn’t require concentration, instead having a scaling CL-based duration. True grit is replaced with atk, damage and save bonuses in addition to haste or alter time’s effects, and these effects also apply versus targets slowed. The epoch-walker is a soulknife who gets martial tradition and blended training (Low-Caster, Wisdom as casting and practitioner modifier, class level + Wisdom modifier spell points), and gains the Time sphere. Instead of psychic strike, we have inevitable strike, which translates to a circumstance bonus equal to ½ class level to the next attack roll. A target hit or ally touched can be sensed and may be affected by alter time regardless of distance, with Wisdom modifier acting as the cap for the number of such bonds in effect at a given time. The archetype also receives a unique capstone, which makes the bond indefinite in duration and the character auto-resurrect. Surprisingly cool engine twist – as a minor nitpick, it’d have been nice to note that the charge for inevitable strike can be held indefinitely, but as a whole, really neat. The hasted blade swashbuckler is proficient with simple weapons and light armor and bucklers only, and gets martial tradition and blended training (Low-Caster, Charisma as casting and practitioner modifier, class level + Charisma modifier spell points) and loses panache for the spell pool. The archetype gets the Time sphere and 2nd level offer the chance to retaliate with a free action self-only haste for 2 spell points, replacing charmed life. 3rd level nets a slow-attack synergy instead of swordplay, and 4th level’s bonus feat is replaced with the option to expend an AoO to move half speed while under haste. 15th level nets Improved Haste, including an increased AC and Reflex bonus, and the capstone nets basically a permanent haste, as well as means to resist paralyzed and entangled conditions, etc. Temporal trapper rangers are proficient with simple weapons, light armor and bucklers and gets a martial tradition and blended training. (Low-Caster, Wisdom as casting and practitioner modifier, class level + Wisdom modifier spell points), and the archetype gets the Time and Trap spheres. (Yep, the archetype does have a non-Spheres of Might-reliant option included). Instead of combat style, 2nd level allows for the combination of Trap effects with alter time at additional spell point expenditure, and woodland stride is replaced with an immediate action chance to modify a Trap sphere’s dart to target a creature with alter self. Whenever a combat style feat’d be gained, the archetype may choose from Trap or Time sphere talents, and the capstone allows for the banishment of trapped targets in temporal stasis. The Time Knight paladin only gets proficiency with simple weapons, light armor and bucklers, and is a Low-Caster using Charisma as casting and practitioner modifier, with class level + Charisma modifier spell points. The archetype gets the Time Sphere and replaces detect evil with detect chronomancy. Aura of courage and aura of faith are replaced with save-bonuses to Time effects, and a disruptive aura that hampers spell/SP-use. The capstone includes a brutal timeline-removal smite, and the archetype comes with a proper code of conduct. Time stalker slayers lose shield proficiency, and get quicker studied target, at the cost of Constitution damage; 13th level’s slayer’s advance is replaced with immunity to negative temporal effects. (minor nitpick: Spell-italicization missed), and the archetype has a custom capstone. Not impressed by this one. The time thief rogue replaces the 2nd level’s talent with the 1/round option to steal time from targets successfully sneak attacked, allowing for action-theft on a failed save, with sneak die progression tied to the action stolen. Interesting! 10th level allows for the theft of lifespans when defeating foes (can’t be kitten’d) and the archetype has a unique capstone. Neat, fun engine tweak. Beyond these archetypes, we gave a new armiger prowess (missing the bolding of the ability header), and a new hedgewitch tradition – the temporal traveler, who gets Disguise, Knowledge (planes) and Knowledge (history) as class skills, as well as Time sphere as a bonus talent. The tradition nets an insight pool equal to casting ability modifier (minimum 1) and may use these insight points to perform a variety of custom deeds, with insight replenishment based on spending 2+ spell points on a sphere power or class ability, and insight can act as a grit, panache, kismet or luck. Cool tradition. There is also a general secret provided, and fans of the luchador may choose the fast-time pin grapple-enhancer, which, while potent, is balanced with a fatigue cooldown. The book also has two new mageknight mystic combats. Sages (chakra disruptors and infusers) can choose the ponderous touch esotery, adding slow to combat maneuvers; three cool new scholar knacks are included for amateur chronomancy and building on that, and soulknives can learn to deliver magic sphere abilities via their blade. Rogues and slayers can choose a slowing strike, and both luchador and vigilante may choose the temporal shifting social talent that helps you maintain your identities via time compression, reducing time to perform longer checks. The Time sphere’s haste and slow abilities are updated, with haste now offering optionally for the granting of an AoO, and the latter preventing AoO-use – these render the sphere, particularly in conjunction with the options herein, more interesting. The pdf contains 17 new basic talents, which allow you, for example, to age or restore objects (which has vast utility usefulness) and even rewind their enchantments while concentrating, affect natural healing by quickening it via haste or impeding it via slow…and no, these can’t be cheesed. Debuffing targets with broken time, direct damage via causality, delaying the onset of damage on objects, etc. is cool (with a typo “alliedally” should read “ally”), and there is a means to afflict targets with lethargy (works imho even better with Everyman Gaming’s Sleeping Rules), a means to improve your response time in surprise rounds – some mechanically complex things here. The precision in the details is impressive – there is a talent that provides a crazy prepared means to get inexpensive objects, and in stark contrast to about 90% of such abilities, it can’t be abused. This kind of foresight is impressive indeed. Decelerated time in a burst, storing actions for future use. It is VERY impressive that this one is not broken per se, but the Group Time synergy of this one IS BROKEN AS HELL. It looks like something got lost there. Anyhow, there is a means to generate temporal traps, time cloning – there may be less talents here than in some of these handbooks, but quality trumps quantity, big time. And yeah, there is the means to make (time) effects affect AoEs. The pdf also contains 7 potent advanced talents, which include instant retraining, retrieval of creatures ejected from the space-time continuum, a means to contact and query a potential future self, and there is a potent option to further enhance the effects of After Image and Eject. The retraining options obviously allow for massive flexibility, so some advice is provided. The two incantations included allow for the transfer of years, and there is a ritual to eject a target from time, until the last one who sealed the banishment in blood vanishes. This oozes narrative potential! We also get the new dream casting tradition, with narcoleptic casting as a new general drawback, and two sphere-specific ones, which prohibit the use of acceleration or deceleration, respectively. The pdf also offers two feats: Spell Capacitor allows you to cast spells into a temporary rift in time, before discharging the held spells simultaneously. This feat is broken and needs to die as written. While the capacitors only last for a minute, this allows you to unleash ridiculous spell-combos in one blast of annihilation. The feat also allows you RAW to unleash the spells and choose targets when you unleash them. There is also a +2 magic item property for staves that works pretty much the same way and allows for the problem to be enhanced even further. This one is really bad and a glaring blemish in this book. Swift Warrior enhances yourself further when alter time’d. (The “benefit”-header is not bolded. There is also a nice trait to sense Time sphere effects and know date and time. The final item is a Store Time chest item, which is neat, but at 10K somewhat underpriced. Editing and formatting on a rules-language level are extremely precise and impressive for the vast majority of the book. On a formal level, there are a couple of typo/formatting-level glitches here. Layout adheres to the series’ two-column full-color standard, employing a blend of novel and stock art. The pdf comes fully bookmarked for your convenience. You can get this brilliant spheres-expansion here on OBS! You can directly support Drop Dead Studios making Spheres of Power material here on patreon! You can support the Ultimate Spheres of Power kickstarter here! For clarity, store time + group time means that you give others the ability to store time, not that you give them all stored actions, so there is no action multiplication, only action shuffling between characters and rounds. Not sure if that was how you understood it. Don’t blame Michael for spell capacitor; I contributed that right at the end. Mea culpa. Thanks for commenting! And yeah, I figured that’s how Time Store + Group Time was intended to work, but as of right now, it can easily misinterpreted, hence why I noted that something, a sentence or the like, may have gone missing there. And hey, re Spell Capacitor: Everyone strikes out sometimes! Still love a ton of your designs! Sorry I didn’t credit you as author, the book didn’t note a contributing author credit for you; rectified. I tossed a few things in, it is still very much Michael’s book. We are discussing fixes for the noted issues. Too bad time is tight for getting blood and fallen fey reviewed before USoP. Did massive SoP testing before allergy struck me down, so I’ll try to get as much SoP stuff done as fast as possible; Abjurer is scheduled for today. I *may* get Sanguinist done before the end of USoP, but I only got that and Fallen Fey from Adam not too long ago, so not sure if I’ll make that in time.